This article gives the precise information about the BBA Jobs 2019 for freshers. 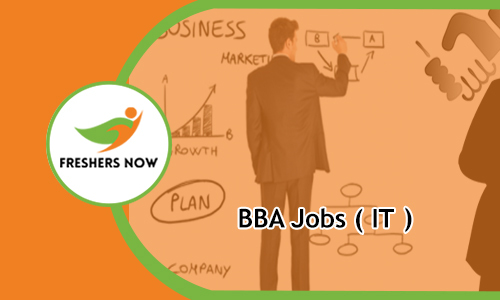 Candidates who are with the BBA degree are seeking for the jobs to help those aspirants we are providing the latest and upcoming list of IT Jobs after BBA. On this page, the contenders can find out the Freshers Jobs in a detailed manner. Many of the candidates are thinking there is a scarcity of jobs for the BBA aspirants. But there thinking is wrong. There are countless of Jobs for BBA graduates. Many companies in metro cities across India are providing a vast number of job openings for BBA fresher aspirants. Generally, the BBA candidates have jobs in various fields of the Business. We are furnishing the each and every BBA Jobs 2019 on this page in the next section. Go through this page completely and find out current Jobs vacancies for BBA freshers. To help those aspirants we are giving the BBA Jobs 2019 of each and every company in the tabular form. So the aspirants can check the info and apply for the willing position before the last date by checking the details. Through this article, candidates can get notified about the Latest BBA Job Notifications 2019. A massive number of aspirants are looking for the BBA Jobs 2019 on the various websites and are you one of the candidates then you reached the right area. From this page, the aspirants can get the Jobs for BBA graduates at free of cost. As there is number of jobs for the aspirants who have good knowledge of management and functions then you can check the suitable job role for your talent from this corner. A lot of BBA graduate candidates are showing interested to do the job in private sector than the government sector. Some of the companies conduct the Walkin Drives to hire the aspirants. As we all know that the BBA is commonly known as Bachelor of Business Administration. This is a more reputed undergraduate course in India. BBA is a full time or part time course which can do after completion of 12th class. The BBA program is designed to provide essential knowledge about the management education and also educate in dealing with the business environments. Every candidate wants to get a good job with high paying salary in their life they can move on to the BBA course. There are thousands of BBA Jobs 2019 in various MNC (Multinational companies) and Startup companies. We are providing the company wise Job Openings for BBA Graduates in the above section. Have a look and apply for the jobs in top companies for the suitable position. Most of the aspirants are wasting their time in searching for BBA Jobs 2019. So for the sake of the candidates who are giving all the IT jobs after BBA in a detailed manner. The candidates who completed their Bachelor of Business Administration can apply for the jobs in Dubai, Chennai, Pune, Delhi, Hyderabad and in some other cities. There are job openings for BBA freshers in abroad also. Contenders from different specialization such as Information technology, Entrepreneurship, Accounting, Human resource management, Design management, Legal management, Management, Finance, Marketing etc are hunting for the BBA Jobs 2019. Some of the companies like Infotech Pvt Ltd, Swiggy, Wipro, Tata Consultancy Services, Genpact, Accenture, Cognizant and in some other startup companies. BBA Graduates can start their career as Sales Manager, Department Manager, Communications Manager, Data Entry Executive, Finance Executive, Business Development Executive, Digital Marketing Trainee, Social Media Executive, Marketing Interns, Supply Chain Distributor, Merchandise Officer and much more. We are giving the latest and upcoming BBA Jobs 2019 for freshers. The interested candidates can check the eligibility criteria and apply for the vacancies. The selection of the aspirants is by checking the performance of written test and Interview rounds. So to perform well in the written test the aspirants can check the IT Companies Syllabus and Placement Papers from our website. This definitely helps the candidates to get the job in their dream company. Along with the BBA Job roles, we are providing the direct link to apply for the vacancies. If the aspirants are suitable for any of the openings then they give a click on that particular role. This link redirects to an article which consists of full details about the recruitment. Check the details thoroughly and submit the form before the last date. The complete details provided on this page helps the aspirants to get a job in the Information Technology (IT). Due to a large number of candidates are coming out after completing the Bachelor of Business Administration. There is a huge demand for the BBA Jobs 2019 in various organizations. To grab the chance the candidates can go through the above table for the Job vacancies for BBA Freshers. Cracking the Interview is the main point to get the job. So check the Interview Questions by company wise on our website. Nowadays Government Organizations are also recruiting the BBA graduates by checking their capability. The candidates can the job in various organizations like RRB, Banking, India Sir Force, OPTCL, KPSC, ITBP, EXIM, HCK etc. Those who are not willing to do the job in the IT sector can apply for the government jobs. We promise the candidates that we update this page with the latest BBA Job Openings 2019 every day. We are sure that this page helps the candidate to get the upcoming BBA Jobs 2019. Our request to the aspirants is to find a good job in the from our website freshersnow.com and make your future bright.